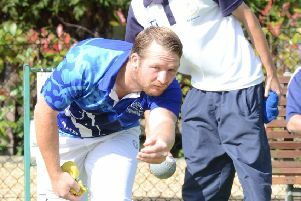 Yaxley bowler Nicky Brett is through to tomorrow’s World indoor singles semi-finals at the Potters Resort in Norfolk following a comprehensive 9-3, 9-1 defeat of his pairs partner Greg Harlow in the quarter-finals (January 25). It was another imperious performance from Brett, who is hoping to win the World title for the second time and make history by reaching three World indoor finals - pairs, mixed pairs and singles - in the same week. His unerring drawing accuracy offered previous few opportunities for Harlow, another former winner of the title, to make his mark. He had one glimmer of hope in the second set when he held four shots which would have levelled the set score at 5-5, but Brett homed in with his final bowl to draw shot to shut the door once again. Brett next meets the winner of the match between Scotland’s Darren Burnett and unseeded Englishman Simon Skelton. Brett beat multiple world champion Alex Marshall in his last 16 match.